Nannette was born and raised in Anchorage, Alaska with family on both sides that went north in the 1940s. And though, she's lived in Salem for over twenty-eight years, her roots in the valley go back to the 1850s when her pioneer ancestors homesteaded what is currently the Baskett Slough Wildlife Refuge in Polk County. Nannette's pioneering spirit and tenacity are central in creating a positive real estate experience that serves her client’s interests. Nannette became a broker in 2008, with the express purpose of being a consumer advocate, not a sales person. She believes there is a difference. Those who work with her experience first-hand what she calls it her, "C.A.R.E. centered approach" which combines Consumer Advocacy, Resources, and Education to create total comfort, and a perfect fit in meeting her clients needs. She never limits agency for buyers or sellers by working with the other side in a transaction. She is there 100% for her client, as their representative. The story behind her Purple Shoes goes back to second grade where she was given the title "If I Were a Pair of Purple Tennis Shoes" in an essay contest. 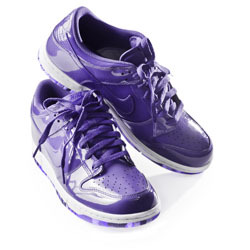 She still remembers imagining she was a pair of purple tennis shoes while writing her winning essay. Early on, her natural ability to put herself into others' shoes stood out. Purple Shoes are just one way Nannette sets herself apart, and serve as a fun reminder that her clients' needs are her top priority, and she is there to serve with heart and sole.